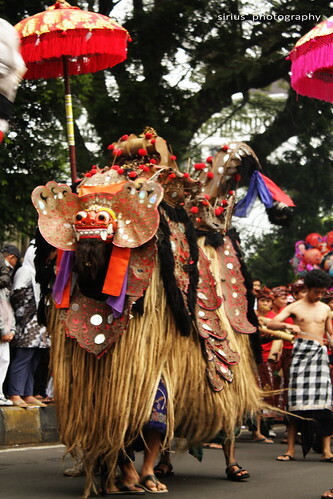 Barong is a character in the mythology of Bali. He is the king of the spirits, leader of the hosts of good, and enemy of Rangda in the mythological traditions of Bali. Banas Pati Rajah is the fourth “brother” or spirit child that accompanies a child throughout life. 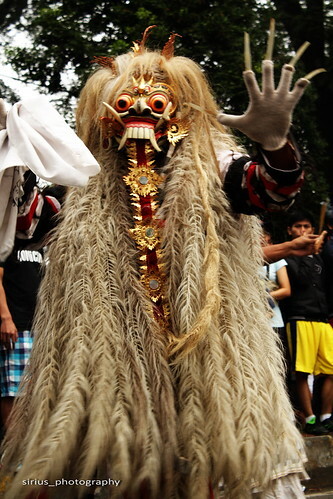 Banas Pati Rajah is the spirit which animates Barong. A protector spirit, he is often represented by a lion, and traditional performances of his struggles against Rangda are popular parts of Balinese culture. Rangda is the demon queen of the leyaks in Bali, according to traditional Balinese mythology. Terrifying to behold, the child-eating Rangda leads an army of evil witches against the leader of the forces of good – Barong. Categories: English, Weekly Photo Challenge | Tags: Bali, balinese culture, Barong, culture, Indonesia, mythological traditions, Rangda, traditional balinese, traditional performances, weekly photo challenge | Permalink. He is certainly scary enough to scare away any evil forces. Ping-balik: Weekly Photo Challenge: Culture (Lost in Translation) | What's (in) the picture? Ping-balik: Weekly Photo Challenge: Culture (Picnic aka Pique Nique) | What's (in) the picture? Ping-balik: Weekly Photo Challenge: Culture (Mosk Courtyard Jemen) | What's (in) the picture?